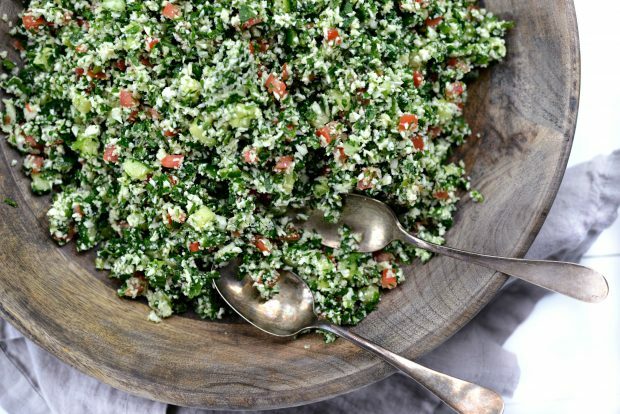 This cauliflower tabbouleh recipe is simple, bright with flavor and healthy. 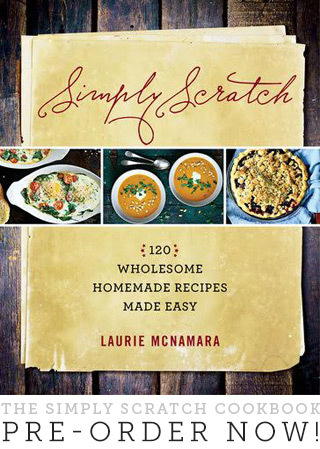 It’s also gluten free, grain free and raw! 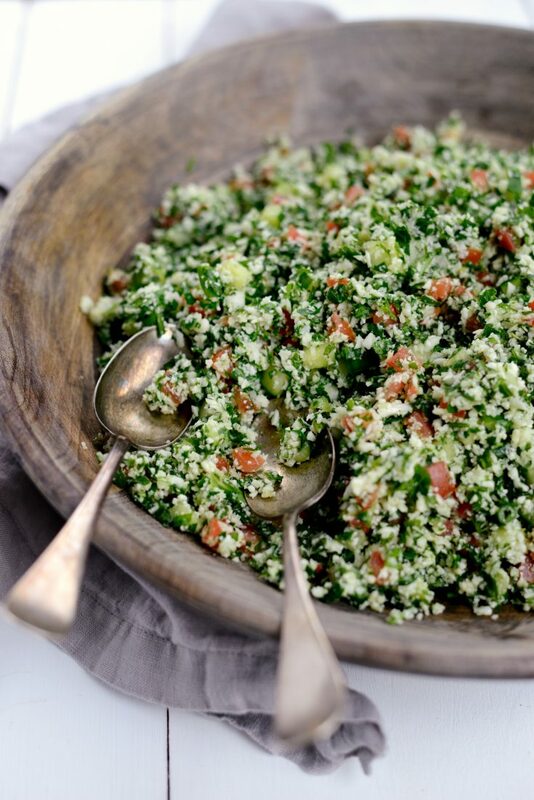 Traditionally this Levantine dish calls for finely chopped fresh parsley, mint, tomatoes and cooked bulgur wheat. 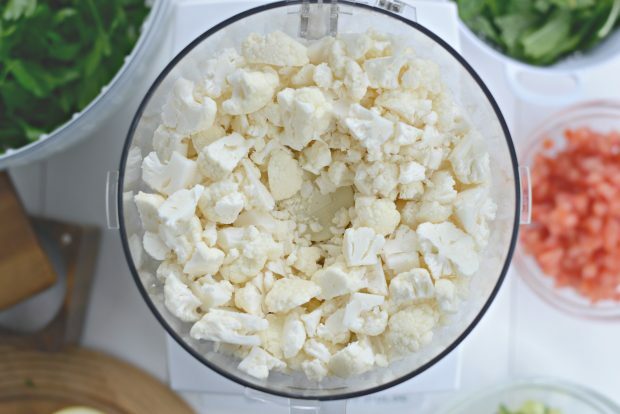 This time, I wanted to eliminate the grains and sub-in some finely chopped cauliflower. 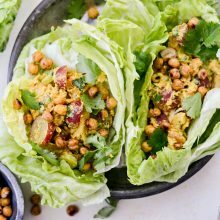 Adding cucumber also gives this recipe some bulk meanwhile also adding freshness crisp texture. 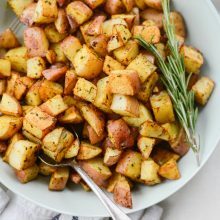 I wanted to keep this recipe on the simple side, so I pulled out my food process to get most of the ingredients finely chopped. For the record, I couldn’t imagine my life with out that bulky, noisy and super efficient kitchen appliance. 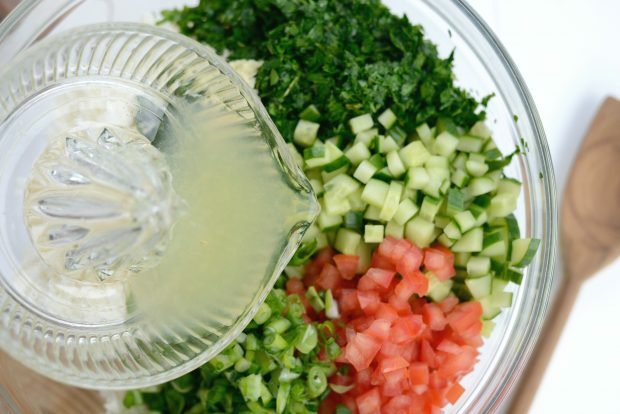 This cauliflower tabbouleh salad is so refreshingly delicious, I tell ya! Once I start eating it, you literally have to pry the fork out of my Kung Fu grip. I eat it all week as-is for a light snack or meal. The other day I grilled shrimp and had it as my side for lunch. However my absolute favorite is to top hummus with it and serve it with veggies and crispy, seedy crackers. 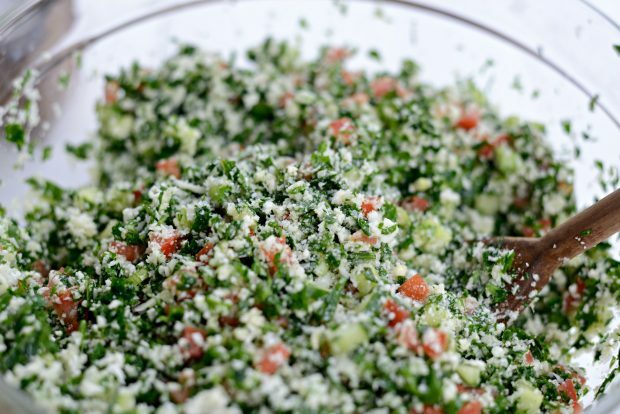 Now that I’ve tasted this cauliflower tabbouleh, I’m pretty positive I’ll never go back to my old recipe again. Since this dish is raw, all of the work is done in the prepping stage. Rinse, wash and chop- it all should take about 20 to 25 minutes, total. So to get some of that prep out of the way, first I finely dice up 3 (seeded) Roma tomatoes, an English cucumber (again, seeded ) and the light and dark green parts of a bunch of green onions (about 8). Sorry, totally forgot to take a photo of those green onions! Next move on to the cauliflower. Start by cutting the florets (from a large head of cauliflower) away from the base.Then cut the larger florets down into small pieces. Next, place the florets into your food processor, fitted with the blade attachment. Secure the lid and process until the cauliflower is in small “rice” like pieces. 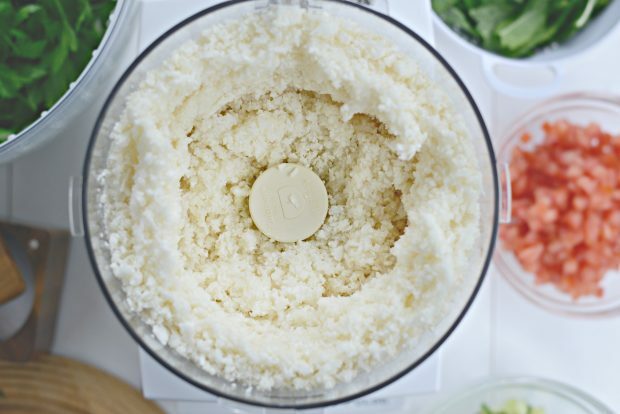 Transfer the cauliflower rice to a large bowl and then rinse out the bowl and run the blade under water. Next, I removed all the leafy green tops to 3 bunches of parsley. It seems like A LOT of herbs and it IS, but once it gets processed it looks a lot different. 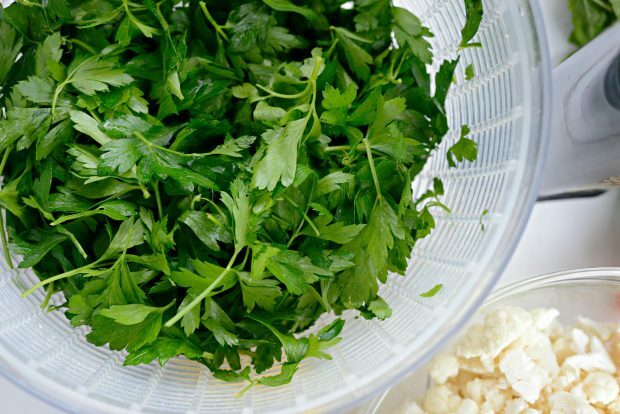 Then I pile the herbs into my salad spinner, rinse under water and spin them until (mostly) dry. 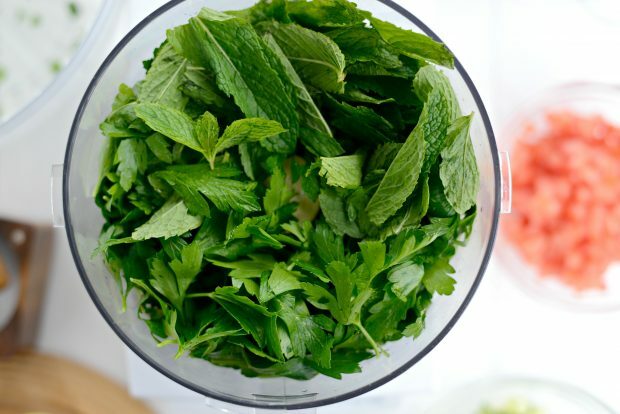 Secure the lid and pulse until the herbs are finely chopped. See?! It’s really not as much as you would think! 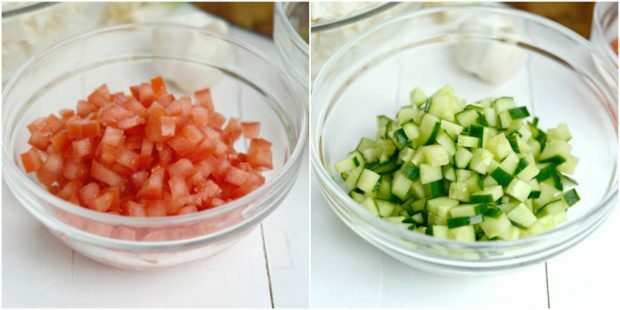 Add the finely chopped herbs to the bowl with the cauliflower and then add the diced tomatoes, cucumber, chopped green onions. Season with kosher salt and fresh ground black pepper, to taste and then toss. 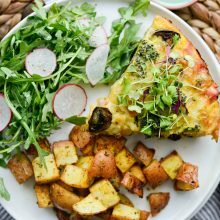 This recipe makes quite a bit, which makes it perfect for bringing to gatherings or eating all throughout the week. 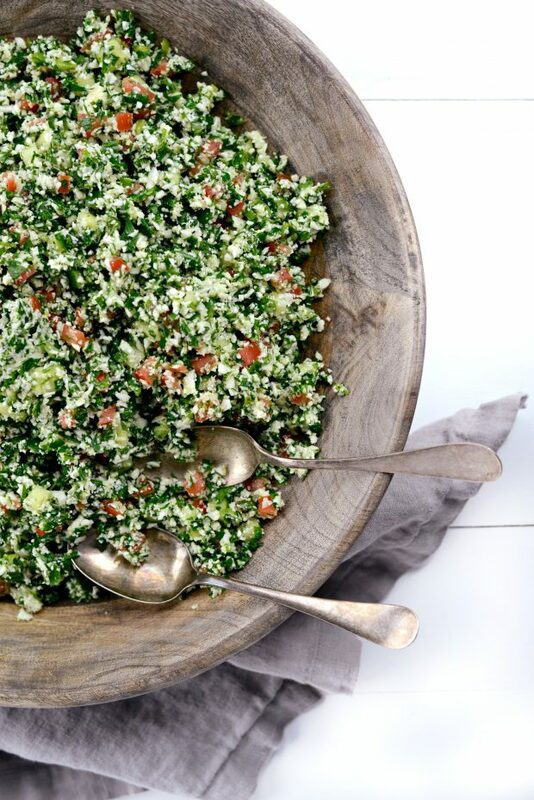 I am absolutely smitten with this version of tabbouleh. 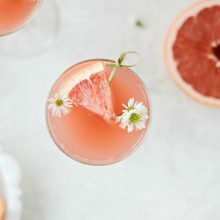 So good and good for you too! 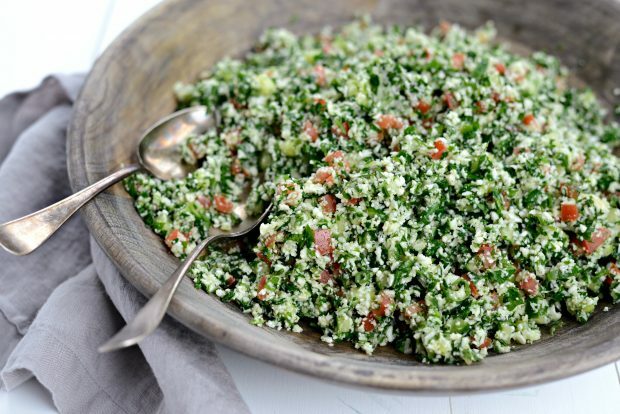 Bulgur wheat is replaced by cauliflower crumbles for a grain free version of tabbouleh. 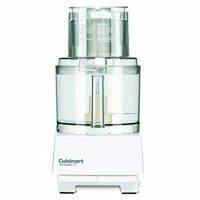 In the bowl of your food processor, fitted with the blade attachment, add the cauliflower florets and process until it resembles rice. 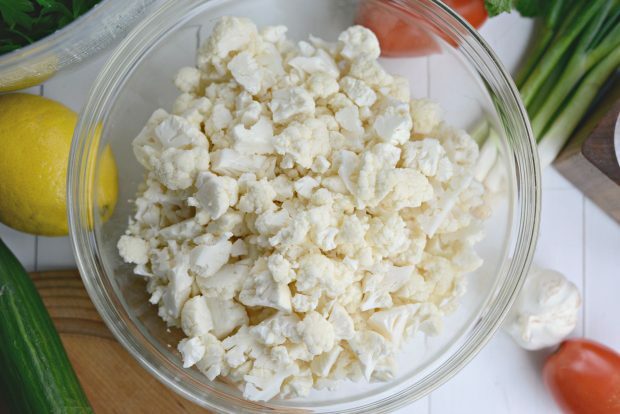 Place the cauliflower crumbles into a large bowl. Rinse the food processor bowl and blade under water. 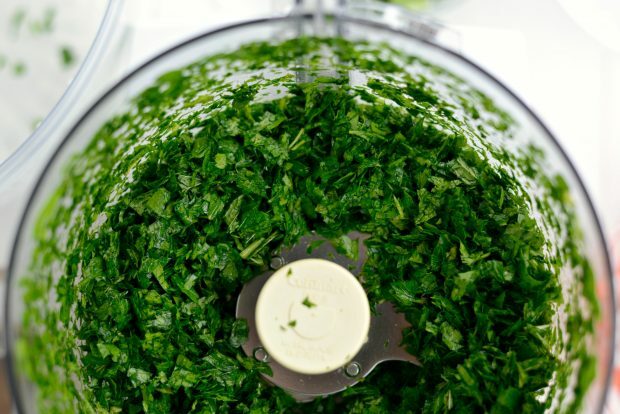 Add the fresh parsley and mint leaves to the bowl, secure the lid and pulse until finely chopped. 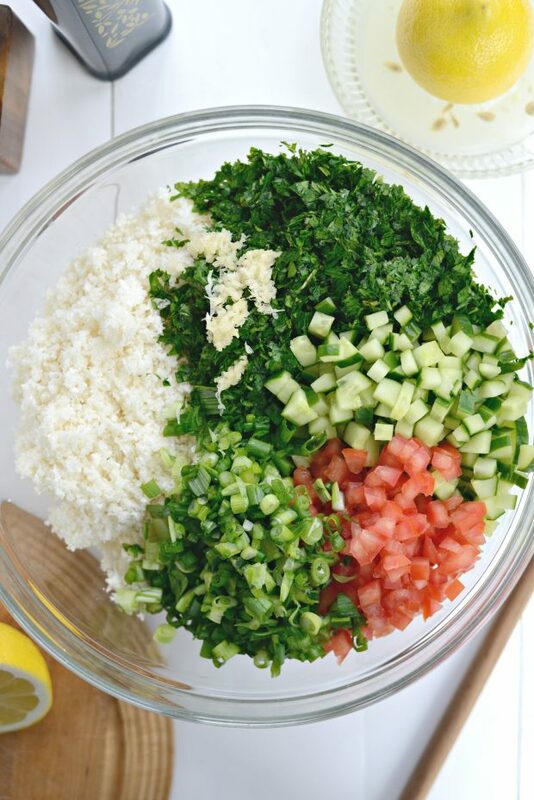 Add the herbs to the bowl with the cauliflower, along with the chopped tomatoes, green onions and cucumber. 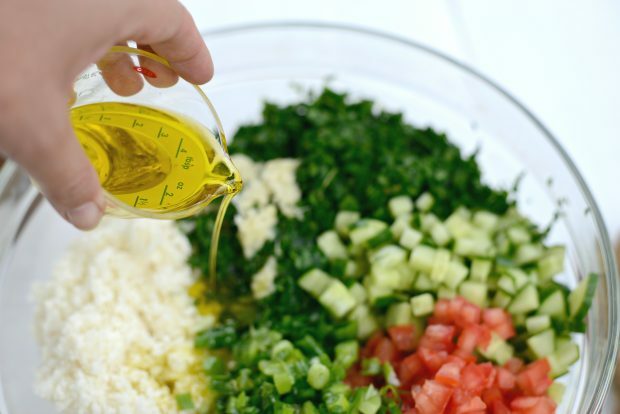 Grate in the garlic and pour in the lemon juice and olive oil. Season with kosher salt and fresh ground black pepper to taste. Ohmygosh! Brilliant!! I can’t wait to try this! 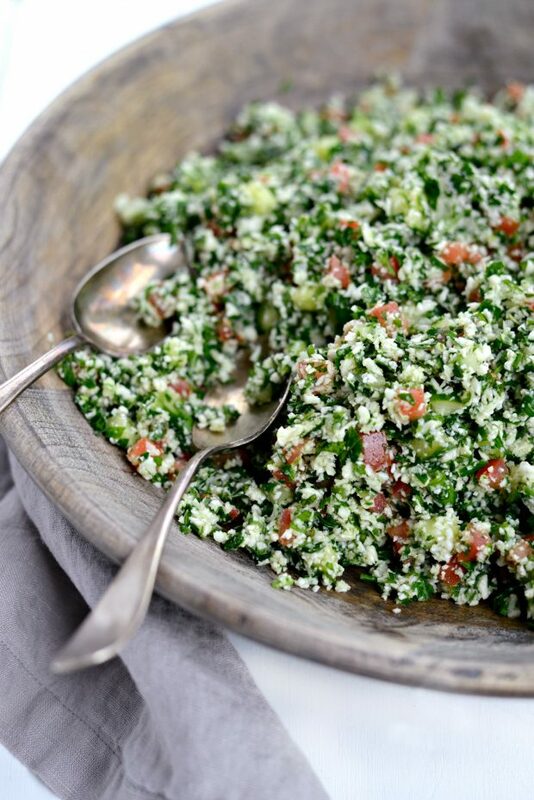 I LOVE tabouleh and usually substitute quinoa for the bulgur wheat to keep it GF. But even that can be a pain. I love the idea of using cauli instead. And you can never go wrong adding cucumber. 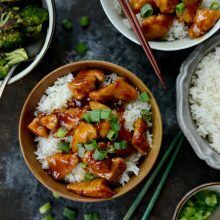 This recipe motivates me to get my new food pro. 🙂 Thanks, Laur! This looks delicious. 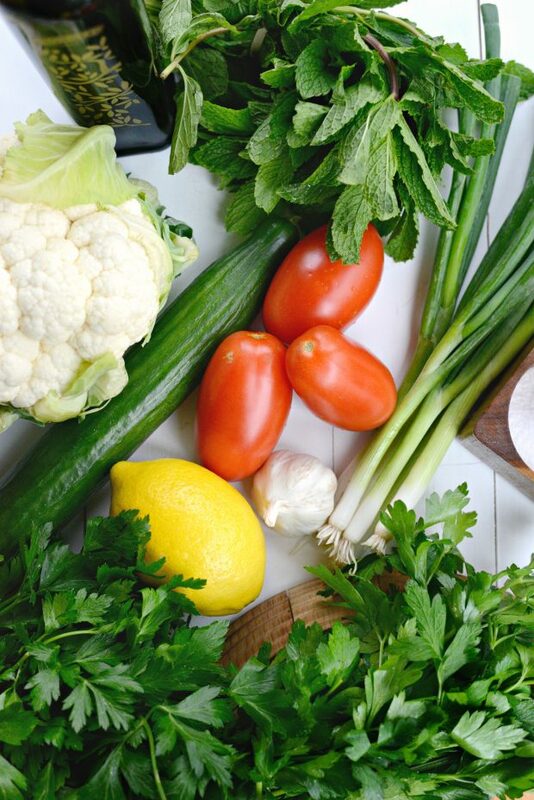 what main course would you suggest with this salad? Hi Connie! 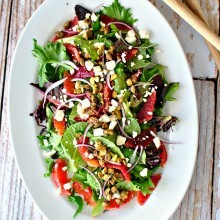 I would serve it with grilled za’atar chicken (which is in this blog) or even a nice ribeye steak. For a meatless option I would do grilled marinated portobello mushrooms. I hope this helps you! Have a great weekend! I made this today but I forgot to buy Mint it was delicious and I couldn’t wait for the flavors to “marry’ because I had to have a bowl right away!!!! The struggle is real! ha ha! I’m so glad you enjoyed it, Bernadette!